We offer the very finest of products in the industry. 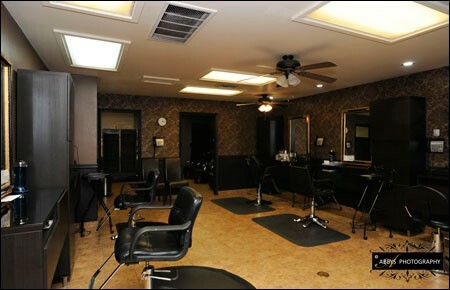 With a large selection of hair, skin, body and nail products, our professionals at Via Bella Salon and Spa will be happy to help select the absolute best products for you, based on your needs. This method of braiding and sewing hair extensions is a great way to add volume, fullness, and/or length to your hair. There is no bonding used, which results in a simple removal process when you are ready. Just one more way to achieve the look and hairstyle you dream of today! Consultations are needed. A quick and easy process that gives you sleek, smooth, and frizz-free hair for up to 2 weeks. Our Bonded Hair Extension systems utilize only 100% human hair, offered in straight, wavy, and curly textures. 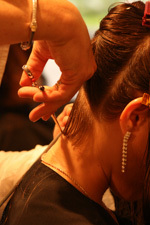 the hair is gathered so that all the cuticle layers are aligned in the same direction. Each strand is pre-bonded with patented protein polymer. (A chemical compound that mimics the human hairs molecular structure.) The protein polymers are activated when an advanced high frequency instrument is used to attach the individual strands. A consultation is needed. Price will be determined after consultation. 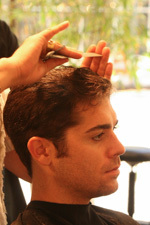 A professional smoothing treatment that improves the health of the hair. Entire treatment completed in 90 minutes with no downtime. Leaves hair smooth and frizz free. The results last up to 12 weeks. Our certified Brazilian Blowout hair stylists are eager to book your complementary consultation for one of the most innovative and effective smoothing treatments in the world. Here is the answer when you are short on time. Soft hands and a beautiful polish is the end result of this thirty minute manicure! During this luxurious treatment your hands with be soaked in a purifying bath followed by an exfoliating treatment to eliminate dry, rough, and cracked skin and to stimulate circulation. Your hands are then covered in a cooling masque and wrapped with warm steam towels. An amazing hand and arm massage is also part of this treatment with a hydrating cream. Polish is then applied. This is the answer when your short on time and need your toes done. This pedicure takes thirty minutes and your left with soft feet and beautiful polish. During this luxurious treatment the feet are soaked in a purifying whirlpool bath followed by an exfoliation treatment to eliminate dry, rough, and cracked skin to stimulate circulation. Your feet are then covered in a cooling masque and wrapped with warm steam towels. An amazing leg and foot massage is also part of this treatment with a hydrating cream. And finally the polish of your choice is then applied. Acrylic nails will provide you with strong artificial nails which are carefully and skillfully applied to ensure proper fit, alignment and a natural look. This revitalizing treatment is customized to meet your individual needs, targeting specific concerns. This treatment begins with a deep pore cleansing, followed by a revitalizing masque, and nutrient rich moisturizer that will hydrate, protect and help restore the natural balance of your skin. A face, neck and shoulder massage will ease your mind and promote relaxation. This blemish fighting facial helps promote a smoother, clear complexion for acne prone skin helping to balance, purify and refine skin texture. This one of a kind patented Vitamin C product noticeably improves your skin's color and texture, wiping away evidence of sun damage, wrinkles, and rosacea. Ultrasound waves penetrate product into deeper layers of the skin, giving you instant results. You can expect to see noticeable improvements in skin firmness & elasticity with reduction in fine lines & wrinkles. Diminishes and smooths fine lines, softens scar tissue, brighten and lightens skin, improves texture and tone, and gives an overall healthier and vibrant texture to the skin. Gradually, in 3 to 6 treatments, will take the skin to a more optimal state of health and improved appearance. Refines and improves skin tone, minimizes fine lines with a light exfoliation process. High concentrations of oxygen are used in a deep cleaning, hydrating, healing and regenerative facial. This is ideal for all skin-types, especially for skin that appears dull and lifeless, for pre and post-operative skin care. Uncover a new layer of skin with gentle exfoliation and relaxing resurfacing. Removes debris from the pores with painless suction. Nourishes with intense moisturizers that quench the skin. The skin's surface will be saturated with antioxidants and peptides to maximize your glow. Includes a parafinn hand treatment, chest and arm massage. This treatment reduces and or eliminates superficial fine lines, wrinkles and other signs of aging. It improves the appearance of pigmentation, acne, scars, and gives all skin types a fresh, healthy looking glow. The treatment, although effective in a single treatment, is suggested as a series of treatments. Red Light Therapy is predominately used for anti-aging benefits because of its ability to stimultate collegen and elastin production. Strengthening of the skin, reducing redness associated with rosacea, helping to retain moisture more effectively, reducing inflammation, accelerating the healing process of blemishes, fading scars, repairing sun damage and improving overall skin tone. Skin rejuvenating ultrasound treatment involves the production of high frequency sonic waves combined with frictional heat to penetrate deep below the surface of the skin to gently exfoliate, repair cells, tone muscles, increase blood circulation, cleanse away toxins, reduce puffiness, swelling and maximize the absorption of skin care products. You will see a noticeable reduction of fine lines, wrinkles and firmer skin. Also beneficial for areas such as stomach, thighs, under arms and breasts. Prepare your body for child birth and relive the aches and pains of your changing body. Your body is supported and placed in comfortable positions for the full massage experience. Your body is also stretched to achieve your maximize comfort. Please wait until you are at least 3 month. Fully licensed in prenatal massage. Please call (661)322-5474 for our appointment policies.